In the picture above you see my parents and the 8 children in our family. My oldest sister is Phyllis, (standing second from the right). Phyllis is a half sister having a different father than the rest of us. My father died in 1977 at the age of 56, primarily from COPD. He, we later found out, was the carrier of this syndrome. Until about 5 years ago our family, like many others, had never heard of Lynch Syndrome. My sister Cindy, (standing second from the left), was the first one in the family to get sick, diagnosed with colon cancer at the age of 53 in 2001. She eventually is the key to identifying our family health issue. Because Cindy had colon cancer at such an early age most of us in the family started getting tested. My brother Mike, age 55, (standing third from the right), having no symptoms, went in for a routine colonoscopy and they found a tumor so large that they could not get the scope over to the right side. The tumor turned out to be malignant and was removed the next day. This was in 2002 and we are all pleased that he is perfectly healthy today, with no further issues. My sister Cindy, in 2004 at the age of 56, comes down with stomach cancer. Surgery and treatments followed, which left her cancer free until 2011. In 2007, my sister Kathy, age 52, (standing at the far right), was diagnosed with stage 4 stomach cancer. Sadly Kathy was the first to loose her battle with cancer in early 2009. Even with all of these cancers occurring in 3 different siblings, at early ages, no one involved in their treatment picked up on the fact that something was wrong. We all just felt like we had some kind of bad genetic issue going on but did not know that genetic testing was needed. in 2011 Cindy gets sick again with a reoccurrence of her stomach cancer and also liver cancer. Cindy was being treated by an oncologist at Barnes Hospital in St Louis. When the pathology report came back on her liver cancer the doctor told her that something strange was going on. He had determined that her initial colon cancer, her stomach cancer and now her liver cancer were all independent of each other, all being primary malignancies. Because of this he referred her to a geneticist. After looking at our family history, going back as far as we could, the geneticist told Cindy that she would test her but believed that our family had a problem call “Lynch Syndrome” and that it most likely came from my fathers side of the family. Cindy’s test came back positive for the MLH1 mutation. Our mother was and is still living so we had her tested and she came back negative so we know the mutation came from Dad. Our grandfather died in his mid 40’s and we found that he had died from colon cancer. Since we found out in 2011 about this genetic problem several things have happened. Sadly in 2013 two more of our siblings died. Cindy, after battling colon, stomach and liver cancer over a 12 year period passed away. Also in 2013 our brother Chuck, (standing at the far left), died at the age of 60. Chuck primarily died from COPD, but his doctors were pretty sure he also had colon cancer. Chuck did not have medical insurance and chose not to get tested for Lynch. In 2011 our brother Tim, (sitting on Mom’s lap), at the age of 51 had a routine colonoscopy. They found a flat polyp which was biopsied and found to be negative. Flat polyps however have a high risk of eventually turning bad so he chose to have surgery. Thankfully he made this decision because post-op this polyp turned out to be a malignancy. After successful surgery and treatments Tim recovered and was fine until 2013, when at the age of 53 he was diagnosed with glioblastoma brain cancer. Tim had successful surgery and is still receiving treatments for this condition. 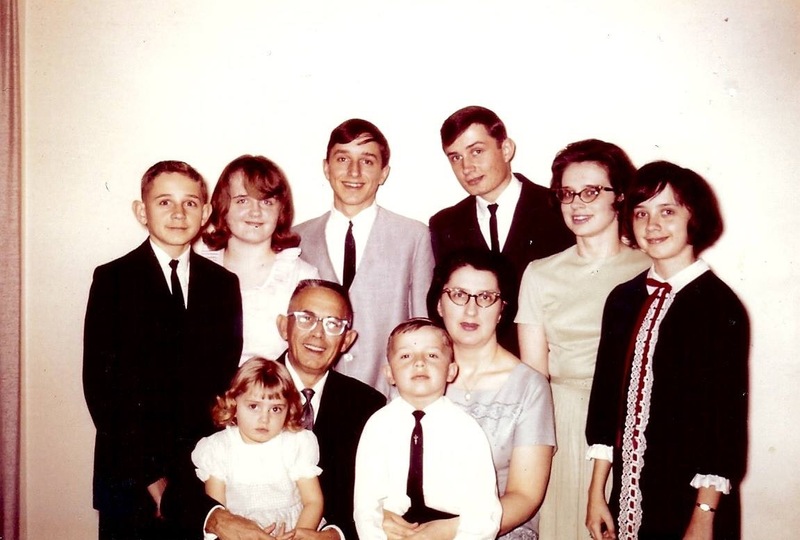 The only sibling of the 7 children from our father to test negative was Patty, (sitting on Dad’s lap). I myself, (standing third from the left) also tested positive for this mutation. Unfortunately I have passed this on to one of my 2 daughters, Tiffany. Tiffany is the mother to my 2 grandsons, ages 6 and 8, so the boys will need to be tested in the future. I am a previvor and am thankful for every day of good health. I have many days however when guilt creeps in knowing that I am the only one in the family with Lynch that has not had any cancer issues. My day is probably coming but it hurts to see other family members suffer this burden. As many of you know, one of the biggest issues surrounding Lynch Syndrome is the lack of knowledge in both medical community and amongst ourselves. This is why I chose to get involved with Lynch Syndrome International. I want to do all I can to raise awareness of this problem. Hopefully advances will continue in the area of research that would help my daughter and possibly my grandsons down the road. Currently I serve as Treasurer for LSI. Our organization is striving to assist in any way we can to those afflicted with this problem. We are a non-profit with a very meager and conservative budget. Contributions to LSI are tax deductible. Any support you might be able to send our way would be greatly appreciated.